The magnitude of the repair job is mind-boggling: Every day, around 100,000 of the building-blocks (‘bases’) in the genomic DNA of virtually every cell in our bodies suffer damage, and are chemically altered. Left unrepaired, these alterations in our genetic material can kill cells, induce the development of tumors, precipitate premature ageing and cause congenital diseases when they occur in germ cells. However, evolution has equipped cells with highly efficient mechanisms for the repair of DNA damage. 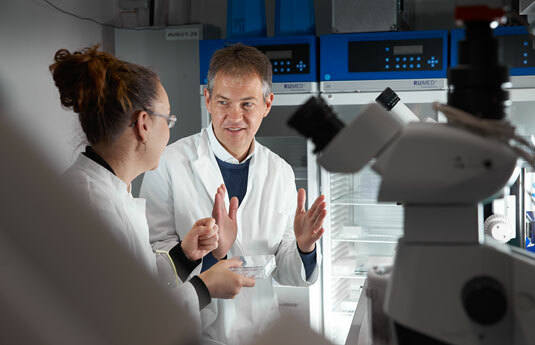 At LMU’s Gene Center Karl-Peter Hopfner is studying the complex molecular machines that make it possible for cells to locate adventitious damage and enzymatic errors and repair or remove the modified bases. With the aid of high-resolution methodologies such as X-ray crystallography and cryo-electron microscopy, Hopfner elucidates the structures and modes of action of the molecular machines that tackle this gargantuan task. In order to develop effective treatments for disorders that result when these systems themselves are defective, detailed knowledge of their molecular form is an essential prerequisite. The Deutsche Forschungsgemeinschaft (DFG) has now acknowledged Karl-Peter Hopfner’s contributions to research by awarding him a Leibniz Prize. According to the citation, the award is conferred on Hopfner “for his outstanding work in structural biology and genome biology, which has made ground-breaking contributions to the fields of DNA repair and the cellular recognition of foreign nucleic acids.” The DFG goes on to point out that Hopfner has made crucial discoveries relating to the repair of DNA double-strand breaks and the recognition mechanism employed by a sensor of DNA damage, as well as providing essential insights into the process by which components of the innate immune system sense the presence of viral and bacterial DNAs in infected cells. Karl-Peter Hopfner is Professor of Biochemistry at LMU‘s Gene Center. Born in 1968, he studied Biology at the University of Regensburg and at Washington University in St. Louis, and obtained his PhD in Biochemistry at the Technical University of Munich (TUM). He was a staff member of the Max Planck Institute for Biochemistry in Martinsried and of the Scripps Research Institute in La Jolla, before being appointed to a professorship at the Gene Center 2001. In 2007 he became a full professor and was appointed Director of the Gene Center in 2015. Hopfner has won several awards for research excellence, and received an Advanced Investigator Grant from the European Research Council in 2012. The Leibniz Prize is regarded as the most important German award for research. This year the DFG has selected 10 researchers for the Prize. The winners each receive 2.5 million euros which they can use for up to 7 years to finance their research.